On September 9, 2012, Rev. Tony Ponticello addressed the congregation at the Community Miracles Center in San Francisco CA. What follows is a lightly edited transcription of that lecture. A Course In Miracles talks about salvation, quite a bit. Many people have trouble with the concept of salvation. They probably have a lot of traditional Christian baggage with the word. Of all the words that I hear people say they have trouble with, “salvation” is one of the words that comes up a lot, maybe more than any other. When I think of the A Course In Miracles’ teaching on salvation, I think of this particular quote from the Course and it gives a different spin on the concept. “You are not saved from anything, but you are saved for glory. Glory is your inheritance, given your Soul by its Creator that you might extend it.” (OrEd.Tx.10.31) When the Course is talking about salvation, it might be good to remember it is not really talking about us being saved from anything, but about being saved for something. We are saved to be introduced, and to introduce to the world, the idea of glory. We’re being saved so that we can demonstrate glory and be an exemplar of glory. Glory is what I want to talk about today. I’ve always liked that word. It is one of the concepts that, when it comes to mind, always makes me smile. Glory is talked about a lot in A Course In Miracles. I looked it up and there are 85 references to the word “glory.” We can think about the word “grandeur” as similar to the word “glory.” There are 34 references to the word “grandeur.” The word “glorious” appears 17 times. ACIM talks a lot about glory, grandeur and things of that nature. A Course In Miracles wants us to answer the question, “Who do you think you are?” by saying, “I think I am the holy Child of God. That’s who I think I am, and I think the glory and grandeur of my Creator is my own glory and grandeur!” It is interesting to hold that perspective. It was interesting for me to hold that perspective of glory, and then to watch the Republicans, at the Republican National Convention, held in Tampa Florida a week ago, play around with the idea of glory. One of the things A Course In Miracles says is that we should be aware, and that we shouldn’t try to push glory away with some sort of false humility. I was thinking about that when Mitt Romney was talking about his wife Ann. She really had the important job. His job, of making countless millions (laughter) wasn’t truly the important job. Ann’s job was the important job, raising those five boys. That was the important job. This struck me as kind of odd, and sort of condescending. Was he saying the real job of a good woman was to raise children? Is that when women really are grand and glorious, when they are raising children? Maybe it didn’t strike other people as condescending. I am very sensitive to gender role stereotypes. Maybe it was just a lovely moment, that Mr. Romney was trying to share with his wife. I’m sure there was all of that there too, but for me, there was also that undertone that there is one grand thing for women to do. What that grand thing is, is to have and raise children. Maybe this is just my Liberal leanings bringing that up. Just in case I am to write this up as an article (Writer’s note: Obviously I am doing that right now.) I don’t want people to think I am just a “bleeding heart Liberal.” (laughter) I want readers to know that I am an equal opportunity criticizer. President Obama thinks it’s really glorious and grand to brag about the people that he has killed. I love that one. (laughter) That one really gets me the wrong way. He killed Osama bin Laden! Some Liberals are surprised at this tendency in Obama. I don’t know why, because all throughout his campaign in 2008 he talked about how he was going to find and kill Osama bin Laden. There was always a very strong emphasis on the “k” word. Obama was just fulfilling his campaign promise. We all get our glory, and we all see it, wherever we see it. I have things to forgive on both sides. I have disagreements with both sides and with both candidates. I love politics. I really do. I love this time in the campaign when we are looking at the candidates closely, thinking about them, thinking about the parties, and thinking about the country. I love the political discussion that we have. I love the discussion that we have about our values. I do see politics as being very worldly, that’s true. I don’t expect my politicians to, necessarily, be enlightened people. Generally they live up to my expectations. (laughter) of not being, particularly, enlightened people. I enjoy the process though. I enjoyed the Republican convention and I’m looking forward to the Democratic convention. If you look up the word “glory” in the dictionary it says, “1. high renown or honor won by notable achievements, praise, worship, and thanksgiving offered to God. 2 magnificence; great beauty.” We generally think of God as glorious. We have a lot of artistic imagery of God as glorious. Frequently this is visualized as billowing clouds parting to the sky, big beams of light shinning through the clouds ... the glory of God. Maybe there are Herald Angles flying around – you know Angels with the big, long trumpets “de-der de-der.” (Rev. Tony puts his closed fist up to his mouth and mimics trumpet sounds.) (laughter) Herald Angels announcing something glorious – that’s great imagery. The importance of that imagery, for us, is to remember that glory is for us! That’s our glory!. That’s not for God, a separate God. That’s our God-like grandeur. Can we take that in? I think that it is a challenge to truly see that the glory of our Creator is our own glory. It’s a big challenge for us A Course In Miracles students. I do want to give the Republican some kudos. I do think they were trying to evoke grandeur and glory a lot during the whole convention. I thought it was unfortunate that they tend to see it in the past, and hopefully in the future after they win the presidency. They don’t necessarily see it in the present – right now. I think we, as A Course In Miracles students are to see the glory now! Not that we are going to become glorious, but that we actually are glorious now! The glory of Divinity and Reality is shining through all the time. I don’t know how the Democrats will do in that regard either. I am hoping, and we will see. We’ll take a look at it. The dictionary called glory “notable achievements.” What’s a notable achievement? We just had the Olympics in London. The United States had some notable achievements at the Olympics. We won more medals than any other country in the Olympics. We won 104 Olympic Medals, 46 were Gold Medals. The closest country to us was China. China had 88 Olympic Medals compared to our 104. China had 38 Gold Medals compared to our 46. The next country was Russia, who had 82 total Olympic Medals, 24 of which were Gold Medals. We, the United States, were glorious. Everybody can connect with that a little bit. It feels good that the United States won all those medals. I don’t know anybody who puts a negative spin on that glorious achievement. But, we spiritual people have a little bit of a difficulty with thinking, “Maybe we shouldn’t embrace that. It’s rather prideful, isn’t it?” So, we’re better than other countries? We’re not supposed to be better than other countries. We are all one. Isn’t everybody grand? Isn’t everybody glorious? Maybe we think, “We’re just a large country.” “We’re a wealthy country.” We have the money to train our young people so they can become these star athletes. There are reasons why we win so many medals. 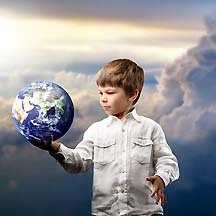 It doesn’t mean we are intrinsically better than any other human beings anywhere on the planet. I have all these thoughts going on in my mind that make it “okay” for me to feel good about the fact that we had that notable, glorious achievement in the Olympics. Otherwise it would be my ego feeling pride, right? This is the stuff that goes on in my mind all the time. When I think of this, I ask, “Can I just let this all go?” Can I just not get all caught up in the egoic idea of whether that’s pride. Does that means that I think we, as a country, are better than other countries. Can I just relish in the glory of it? It was glorious. We won. We did great. We won 104 Olympic Medals. We won 46 Gold Medals. It is really wonderful. We all have to figure out how we can sit comfortably with the whole grandeur versus grandiosity question that A Course In Miracles talks about. I don’t think it means changing the dialogue we have about things. I don’t think it means adding a false humility dialogue like Romney did, in his speech, by saying his wife had the more important job in the family. Wasn’t there just a wonderful, glorious way for Mitt Romney to talk about his wife, that she was a wonderful glorious mother? Couldn’t he have just talked about it with a glorious affect, instead of having to compare it and saying that it was more important than his job? Did he add this dialogue to give himself permission to be glorious? I want to challenge all of us to not do that. Be in grandeur. Be in glory, and enjoy that. Feel it in a wonderful and truthful way, without having to add the other dialogue. In another place, in A Course In Miracles, we find this. I love this quotation. It was in the reading that we had for today. It says, “They ...” it’s talking about the open minded “... “They [The openminded] have in truth abandoned the world and let it be restored to them in newness and in joy so glorious they could never have conceived of such a change. Nothing is now as it was formerly. Nothing but sparkles now which seemed so dull and lifeless before. And above all are all things welcoming, for threat is gone.” (OrEd.Mn.4.24) This is one of the “glorious” quotations. Remember there are 17 references to “glorious.” If you add those to the 85 references to “glory” that makes 102 references to a word related to glory. It is obviously a big concept if it is mentioned 102 times. The world can be glorious to the open minded, the ones who aren’t adding the false humility dialogue all the time. The open minded can see, feel, and experience the glory of things. They see it as a reflection of the grandeur, glory, and divinity of God that is their own divinity as well. The open minded can just relish in it. The open minded can get nurtured by it. Then I like when it says, “Nothing but sparkles now.” That is what happens when we get truly in touch with glory. We sparkle. Sparkle, I have a little bit of an easier time with. (laughter) It might be hard for me to think about the clouds parting, the beams of light, and the Herald Angels playing their trumpets – but just sparkling a little .... (laughter) I’m pretty cool with. I’m pretty down with that. I can sparkle. I do sparkle! I’m a sparkly guy! Sparkle is an interesting word in A Course In Miracles. It’s actually mentioned six times and all of them are in a very positive way. Here’s one, “The outcome of the lesson that God’s Son is guiltless is a world in which there is no fear and everything is lit with hope and sparkles with a gentle friendliness.” (OrEd.Tx.31.8) It sparkles! I don’t hear ACIM teachers talking about sparkling. What is ACIM teaching us? It is teaching us how to sparkle! We make the world a sparkling place. I like that. 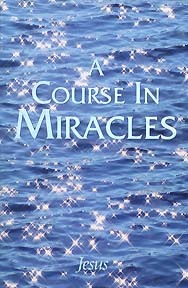 A couple of years ago this new edition of A Course In Miracles came out – a new printing of ACIM. It had a cover with sparkles on it. (Rev. Tony holds up a copy of the Sparkly ACIM book.) It looks like they are reflections of the sun on water with a blur, gauzy focus. 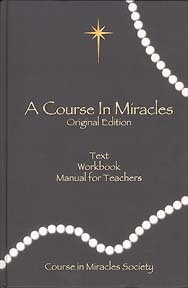 The cover sparkles, and the book quickly became known as the Sparkly edition of A Course In Miracles. Nowhere in it does it call itself the Sparkly edition, but that is what everybody calls it. It’s the Sparkly edition of A Course In Miracles and everybody loves this book for some reason. Even though what is in it is basically the same as what is in other editions – they love the cover! (laughter) They just love the cover. A sparkle is a little glint of reflected light. Actually “glint” and “sparkle” mean exactly the same thing – a little ray of reflected light. I think this is what A Course In Miracles is calling us to do. Be a glint – a glint of reflected divine light – here in this world. Sparkle! Show a little bit of your divinity. You might not have those Herald Angels’ trumpets, but you can do something to bring divinity to mind. Not everybody is going to have my sparkle. Not everybody is going to have my style. Thank God. Then I wouldn’t be unique. However, we can all do something. I think the simplest thing, the easiest thing we can do and that we all do do, is just smile. A Course In Miracles says that is how we really can tell who a teacher of God is. They don’t look any different. Teachers of God simply smile more frequently. (see OrEd.WkBk.155.1) Smiling is a face sparkling. It is the way the face lights up. It lights up the eyes; it lights up the mouth. The face then reflects light to the other person, and they smile back. Glory – find some way to connect with it. Find a way to feel comfortable with it. However, when it gets so “awe-full” and heavy, don’t try to diminish it with some false humility that defines it away, rationalizes it away. Don’t defend against the ego pride that may come in. Just find a way to sparkle in your own life. Sparkle to the people around you. I think if we all do that, we will really do honor to the glory of our divinity. This article appeared in the October 2012 (Vol. 26 No. 8) issue of Miracles Monthly. Miracles Monthly is published by Community Miracles Center in San Francisco, CA. CMC is supported solely by people just like you who: become CMC Supporting Members, Give Donations and Purchase Books and Products through us.